We are the reckoned manufacturer and supplier of superior quality Hip System. 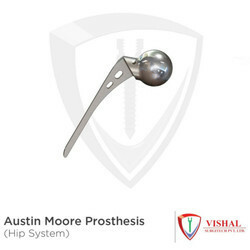 The offered range of system comprises items like Austin Moor Prosthesis XL, Bipolar Hip Prosthesis XL, Modular Bipolar Prosthesis XL and Shoulder Prosthesis XL. This system is designed using basic raw material and sophisticated technology, under the strict supervision of our professionals. Apart from this, it is rigorously tested on various stages by our experts as per the medical standards. Our offered system is used hip fracture due to accident. Used during bone surgeries of hip, this Shoulder Prosthesis XL is highly demanded in various hospitals, nursing homes and medical centers. The offered component is precisely manufactured using the best quality raw materials and the contemporary techniques at our advanced manufacturing unit. In addition to this, we offer this prosthesis at rock-bottom prices. Keeping track with advanced medical advancements, we are engaged in offering a huge array of Bipolar Hip Prosthesis XL. With high precision, the offered prosthesis is widely demanded in orthopedic centers and hospitals for carrying out surgery of hips. Clinically examined by our quality professionals to deliver the defect-free product, this prosthesis is offered at reasonable prices. Incepted in 2011, we have emerged as the prime firm, betrothed in providing Hip Prosthesis. The provided prosthesis is highly cherished among the clients to support the hip injury or fracture efficiently. This prosthesis is manufactured by our deft professionals in adherence with industry standards using topnotch quality raw materials and avant-garde techniques. Clients can avail the offered prosthesis from us in several specifications at industry leading prices within promised time frame.